The following articles contain valuable professional development tips and education, as presented at the 2018 TOCA annual meeting. Read on to learn more! Productivity + Hacks to help make your job easier. Ren LaForme, from the Poynter Institute, shared pointers on the digital tools for connecting with reader audiences, as well as presented information on improving modern storytelling and transitioned to his new topic by saying once you have shared the story, you need to engage with your audience. Lisa Lochridge shares tips and information about preparing for a media crisis. Now Director of Public Affairs for the Florida Fruit & Vegetable Association, she advises planning ahead for any event that could disrupt operations and/or damage the reputation or credibility of a company or publication. One of the highlights from the 2017 TOCA Annual Meeting was the writing workshop hosted by Dr. Roy Peter Clark, senior scholar emeritus, musician, author, editor, and Poynter Institute writing instructor since 1979. In recent years there has been a lot of discussion about the decline of the bee population worldwide. Dr. Frank Wong, the Bayer CropScience senior regulatory affairs consultant and the 2017 TOCA Environmental Communicator of the Year, shared his insights on "Pollinators, Pesticides and Public Perceptions." 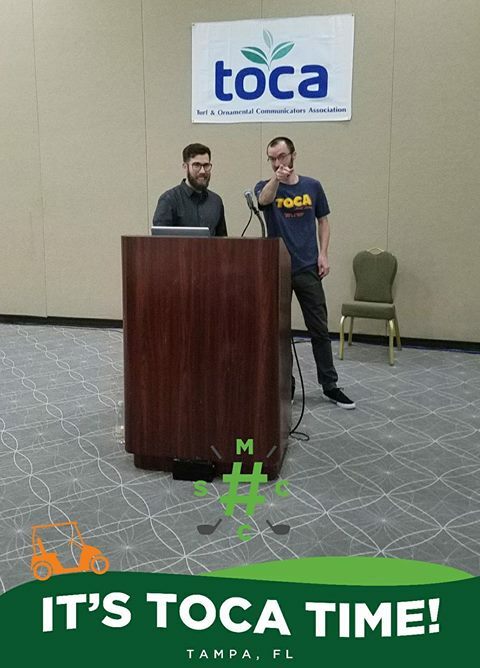 The 2017 TOCA Annual Meeting held a panel discussion on how professionals in the green industry use social media and the verdict is clear: Innovative social media end-users find use of this communications tool a benefit for their business. Social media platforms and tools are evolving every day. To help members stay ahead of the curve, Scott Covelli and Andy Parmann with EPIC Creative took TOCA to the Social Media Country Club during this year’s annual meeting. Attendees picked up their clubs (pencils) and walked through nine holes of trends, duffs and industry hole-in-ones. This year at the TOCA annual meeting, a PR/Editor panel discussion addressed industry trends and provided insight. Here are some highlights. Stephen Wilbers, a writing consultant, columnist and award-winning author, shared his writing techniques and exercises to improve our writing skills. Find out his five elements of effective writing, and easy three-step message and more. Using the skills we learned at the 2016 TOCA annual meeting, member Dawn Rigby created an infographic illustrating the presentation by Jim Novak and Matt Strelecki. This year's TOCA Environmental Communicator of the Year, David J. Shetlar, Ph.D., the "BugDoc," gave a great presentation focusing on urban biodiversity.